. Across the frequency spectrum, up and down the dynamic range, the PH7s take on musical reproduction is cut from whole cloth."
. Low-noise JFETs apply initial gain to the cartridge input. RIAA equalization and further audio amplification use four Electro-Harmonix 6922 dual triodes." "Gain is 57.5dB for both moving-magnet and moving-coil cartridges." "The load can be set for 100, 200, 500, 1000 or 47k ohms and is adjustable through the front panel or remote." Use "Both front panel and remote enable Power, Mute, Mono, and Load. Accumulated power-on hours, accessed by an additional button on the remote, will show on the display for seven seconds. This count is useful for monitoring time on a set of tubes and can be reset." "The remote can also turn off the display and control its eight levels of brightness." Value "Regardless of where you position the phono stage in your pantheon of audio components, Audio Research deserves top marks for the PH7." Mrs. Murphy, my seventh-grade science teacher, gave us a final exam with a single question on it: "What is the most important organ in the body and why?" I answered "the brain" and reasoned that without it I wouldnt be smart enough to take her class and answer the question. Mrs. Murphy gave my ad hominem logic a B+, but she noted that most of my classmates overlooked the brain as an organ. Some folks claim the phono preamplifier is the most overlooked component in a vinyl-based audio system while suggesting it is actually the most important. Two arguments bolster their case. First, the initial amplification seen by the tiny, thousandths-of-a-volt signal from a phono cartridge happens here and, regardless of the quality of downstream componentry, information lost at this point can never be restored. Second, well over 50% of all amplification in a vinyl-based system takes place up front in the phono preamplifier. Back when analog playback was the primary high-fidelity source, preamplifiers typically included phono stages. 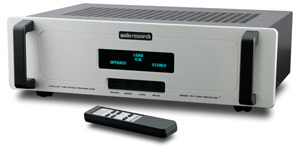 With the advent of the CD, the trend has been toward building standalone phono preamplifiers, and the modern analog systems preamp is often a two-box affair of line stage and phono stage. Make your own call on relative component importance. However, if you want to play records, you need a phono stage, and in high-end audio everything makes a difference. Using the PH7, Audio Research Corporation's current top-of-the line standalone phono stage, has taught me just what a difference a phono stage -- especially this one -- makes to the sound of music. The $5995 USD PH7 improves upon Audio Researchs one-third-the-price PH5 by incorporating proprietary capacitors and the same circuit-board material used in the acclaimed Reference 3 line-stage preamp. Like the Ref 3 (and unlike the PH5), the PH7 adopts vacuum-tube regulation of the power supply, where it relies upon three Russian 6H30 triodes. According to ARC, the PH7s power transformer is larger and its power-supply storage more than triple that of the PH5. Low-noise JFETs apply initial gain to the cartridge input. RIAA equalization and further audio amplification use four Electro-Harmonix 6922 dual triodes. The PH7 measures 19"W x 5 1/4"H x 12"D, weighs 15 pounds, and comes with either a black or classic ARC brushed-silver faceplate. The faceplate includes rack-mount handles and surrounds a green vacuum-fluorescent display that shows the current state of the unit. There are control buttons beneath the display and on a slim plastic remote control. Both front panel and remote enable Power, Mute, Mono, and Load. Accumulated power-on hours, accessed by an additional button on the remote, will show on the display for seven seconds. This count is useful for monitoring time on a set of tubes and can be reset; ARC asks you to contact the factory for instructions. The remote can also turn off the display and control its eight levels of brightness. Backside, the PH7 provides pairs of gold-plated RCA inputs and outputs, a connector for the ground wire from your tonearm, a fuse holder, and an IEC connector for a detachable power cord. Gain is 57.5dB for both moving-magnet and moving-coil cartridges. The output from either goes through the same inputs and circuitry. The PH7 has no knowledge about what type of cartridge is connected to it. Its maximum input is 70mV, so overload from any cartridge is highly unlikely. The load can be set for 100, 200, 500, 1000 or 47k ohms and is adjustable through the front panel or remote. Output impedance rates at 200 ohms, and the unit does not invert phase. Powering up the PH7 puts it through a 30-second warm-up cycle after which you can switch from Mute to Operate. The only minor ergonomic nit I encountered was that the Mute indicator on the display is directly over the Power button. Several times I turned the unit off when I wanted to unmute it. The PH7 entered a system that has seen several changes over the last six months. Thoroughly smitten by OTL clarity and truth during my review of Atma-Spheres M-60 Mk III amplifiers, I swallowed hard and upgraded to the 140W MA-1 Mk III monoblocks. It was a pique of gotta-have, but I rationalized that the amps' gorgeous sound would keep me in my basement listening room most of the winter while their army of 28 output tubes would save big time on upper-Midwest heating bills. The MA-1 Mk IIIs are fed by a Conrad-Johnson ACT2 line stage and power Audio Physic Avanti Century speakers in a nearfield setup. An Ayre C-5xe multiformat digital player sat by patiently, as no silver discs were spun during the making of this review. Shunyata Research Andromeda Helix speaker cables, and Antares Helix and Altair interconnects connected all components. Power delivery comes from a Shunyata Research Hydra Model-8 via a Python Helix power cord. Taipan Helix cords receive power for various components from the Model-8. Turntables bring their own special magic, as I was reminded this past summer when I traded in my Teres 255 for a Teres 320. With its 37-pound lead-damped cocobolo platter, battery-powered Maxon motor, and Stillpoints isolation feet, the 320 improved the sonic character of my vinyl playback in ways Ive not experienced by a change of cables or amplification. Not only did it reveal that my SME V tonearm (with adjustable headshell) was better than previously thought, but the 320 also gifted my entire record collection with a bigger, more lifelike soundstage, gobs of detail, improved low-frequency articulation, and an all-around lower noise floor. My reference phono stage is the solid-state Pass Labs Xono. It connects to the SME tonearm with a venerable FMS Blue II tonearm cable. About two-thirds of the way through the review period, I swapped out a three year-old Shelter 901 cartridge (0.5mV output) for the superb new Transfiguration Orpheus moving coil (0.77mV output). The PH7 review sample arrived straight off the production line in a sealed box with zero hours on it -- just as you would take delivery from a dealer. Audio Research suggests 100 hours of break-in; sure enough, the sound of the PH7 evolved during that period. On first use, it exhibited a darkish character, but without the tubey warmth sometimes associated with that adjective. The PH7 was quiet, clear and detailed, but not particularly spacious or dynamic as compared to what I knew from years with the Pass Labs Xono. Voices and solo violins were slightly dry and had a faint analytical/mechanical cast -- a sound I call "Sovteky" and have encountered before with new Russian 6922 tubes. After roughly 20 hours, things began to change as the soundstage gradually opened up. Around 40 hours, dynamic contrasts became more significant. This evolution continued until the PH7 sounded as Ill describe below. I heard no further changes after 150 hours. My stereo now had more remotes than my video system. The PH7s remote allows the listener to select impedance loading on the fly -- no need to power-down then open the case and manipulate a resistor or set a DIP switch. Flipping through the five available choices, I strained to hear a sonic change with the Shelter 901 on all but the 1000- and 47k-ohm values. There, the top end became a tad gritty with too much sparkle. However, the difference -- even between 100 and 200 ohms -- was more obvious with the Transfiguration Orpheus cartridge. To my ears, the Orpheus with the PH7 sounded best at 100 ohms, and I used that same setting for the Shelter 901. Indeed, Im grateful for having the PH7 during break-in and setup of the Orpheus, whose Ogura PA line-contact stylus and yoke-less generating engine demand care in setting azimuth and anti-skating. The high resolution of the PH7 allowed optimal tweaking of this highly resolving cartridge. Therein may lie a lesson about synergy between cartridge and phono stage. The manual mechanical adjustment of cartridge and tonearm is only as effective as your phono stages ability to let you hear the changes youre making. Looking over my early listening notes, I see the question "Are phono stages a subtle component?" My first impression of the PH7 was "at least it's Hippocratic" -- it does no harm. However, first impressions here did not begin to tell the tale. Maybe this was because of the drawn-out break-in period. Nonetheless, the more I listened, the more I came to appreciate just what a coherent and superbly well-balanced phono stage Audio Research has in the PH7. While the reviewing language helps us disaggregate sonic characteristics as a means to sort virtues from flaws, the sound of the PH7 is best not understood piecemeal by commentary on its individual attributes. Music through it is nuanced, natural, and evocative of whatever sound was transmuted to the grooves. Across the frequency spectrum, up and down the dynamic range, the PH7s take on musical reproduction is cut from whole cloth. The PH7 may not be perfect -- no component is -- but it sure is listenable. And listen I did. Kraftwerks "Musique Non Stop" from Electric Café [EMI EMD 1001] splashes across the soundstage as if someone poured Jackson Pollacks immediacy and Rembrandts mastery of light into balloons and threw them at a canvas. Fat electronic globs of dipped-in-butter tonality burst against a black background, hung in mid-air, and then -- as if someone snipped the tape with a scissors -- they were gone. Solid gone. No ring, no overhang, nothing. Listen to the body and weight of the resonant cello that opens Linda Ronstadts "Talk to Me of Mendocino" from Get Closer [Asylum 60185-1]. Listen to Nora Jones at the piano (Come Away with Me [Classic Records JP5004]) as she sits smack dab in the middle of the listening room between nearfield speakers and the wall behind them. Listen and know how gorgeously right, how aurally holographic, how lifelike the PH7 portrays instruments and vocals in space and time. It doesnt sound colored, and it doesnt sound euphonic; there is no enhanced tube-esque sweetness. I could prattle on about what the PH7 doesnt sound like, but its easier to say that it just sounds more like real music. The PH7 brings forth harmonic structures heretofore lying just below the surface. It's not as if music heard in my system prior to the PH7 was wrong, but it was missing a level of detail and intimacy that lent greater veracity to music played through it. How well it teased apart the beautiful three-part harmonies of Dolly Parton, Linda Ronstadt, and Emmy Lou Harris on the Trio album [Warner Brothers 25491-1]. Even when their voices were stacked in center stage, close in pitch and volume, the PH7 captured the overtones of their subtle inflection to render clear each singers contributions. Voices, triangles, trumpets with mutes on and their unique kwok kwok sound; wooden blocks, violas, the slap of a bongo with and without a hand pressing on the skin; that particular dancing basso-quacky tone you might hear from a solo bassoon: Whatever music I played through the PH7, its notes revealed their hue and shade with depth and richness, which caused me to think of the relative importance of harmonic detail in both live and reproduced music. Phenomenologically, we hear the loudest frequency as fundamental and sense the higher-frequency overtones. The difference in the distribution and intensity of these harmonics largely determines differences in timbre. In the concert hall, we can associate sounds with musicians movements as they play their instruments. In the listening room, apart from channel placement, I find myself relying on timbral differences to identify and separate instruments and voices in space. I heard a nice separation of low and midbass strings, for instance, in Beethovens Pastoral Symphony as played by the Berlin Philharmonic [HMV ASD 433]. Here, conductor Andre Cluytens touch at the start of "The Storm" is brilliant. You can almost feel the first raindrops hit. The wind swirls and gusts between the basses and cellos as growling trombones bring on the thunder. Instrumental images became clearer as harmonic differentiation and phase coherency helped resolve spatial location among closely grouped musicians. The PH7 nicely resolved the interior duet between bassoon and oboe toward the beginning of the Allegro and placed these instruments in proper relation to each other. Microphones captured their sound as woody and dimensional columns of air. The PH7 presented a superb soundstage that typically extended to the boundaries of my speakers and beyond, based on recording. Trumpets and other brass hovered above the strings they sit behind -- just as I hear in the concert hall. And much to my delight, the back corners of the soundstage opened up, as if the orchestra could suddenly afford a couple extra rows of chairs and musicians. It is not that music had gone missing and was now magically discovered; it was that the PH7 parsed through the harmonics of complex passages to locate their sources properly in acoustic space. Listening to the Grumiaux ensemble play Mozarts Quintet No.1 in B-flat [Philips 6500 619] my minds eye sees the exact arrangement the musicians used for the recording. I sense Grumiaux himself standing, shifting fore and back as he plays first violin. For those having doubts about tube-based phono stages, rest easy -- the PH7 is very quiet. To ensure this, Audio Research has held its gain to 57.5dB, and, when the PH7 is paired with a quiet line stage, their efforts pay off. During the low-level passages of Stravinskys Firebird Suite with Dorati and the London Symphony [Mercury SR90226] it was only at very high volume that I heard the faintest whisper of tube rush intermixed with the tape hiss that is pervasive on several of these old Mercury LPs. I cannot say for certain whether this came from the PH7 or the ACT2. Otherwise, I heard no hash or grain. As many have said before, this record is a showpiece for the viability of the vinyl medium. Until I heard it with the Orpheus cartridge through the PH7, I never quite knew what the fuss was all about. By its harmonic rightness and dynamic facility with the Orpheus cartridge, the PH7 gave me a wholly new look at the Firebird. The ability of this combination to unravel and articulate complex musical lines and instrumental contributions during pianissimo passages was simply stunning. Violins playing en masse coupled lightness and delicacy with extraordinary quickness and verve. Together the cartridge and phono stage disentangled the score from each violin section. High-frequency extension with air and bloom was readily apparent, even when the music was quiet. In a more forceful passage, the PH7 articulated an incredible staccato line sustained by the trumpet section for moments longer than I thought possible -- this group has some chops! All the while, a lot was happening elsewhere within the orchestra. From the low-level basses at the opening, to the delicate cadenzas from flute and piccolo, to the massive bass drum wallops in the Second Act, the dynamic expression of the PH7 across the frequency spectrum -- most especially at low levels -- was the best Ive heard from my system. Roughly 200 hours into the PH7's stay, I swapped its four Electro-Harmonix 6922s with a set of quiet, well-matched Amperex 6DJ8s. Hey, audiophiles will be audiophiles! These NOS tubes made a positive difference, effectively doing what fine NOS tubes do. My system never sounded better. The top end became more refined and extended as strings acquired better bite and shimmer, and minute bowing movements became more obvious. String sections took on a dimensional, human quality that melded the smaller bowing movements from each individual into a unique sound from each orchestra. Triangles presented a deeper ring with no hardness as cymbals evinced proper tizzy decay. A last hint of dryness vanished. Such a tube swap isn't mandatory to hear what the PH7 is about, but it improved things here. In the form factor that I own, the two-box Pass Laboratories Xono retails for around $2800. A different version (with identical sonics and interior components) houses the separate power supply in a thick-walled aluminum box matching the phono stage itself and retails for $4200. The Xono is more configurable than the PH7. It provides both single-ended and balanced outputs and supports multiple step-wise impedance loads ranging from 5 to 1000 ohms, plus 47k. Capacitance is variable for moving-magnet cartridges, and the Xono offers three gain settings, up to 76dB. When I listened to music through the PH7 using the 0.5mV Shelter 901, I had to turn up the volume several clicks on my Conrad-Johnson ACT2 to obtain gain comparable to the Xonos output (set at 61dB). With its fixed gain of 57.5dB, the PH7 mandates use of an active line stage, and Id be cautious about mating it with a moving-coil cartridge whose gain was much less than 0.5mV. That said, both phono stages worked well with the Shelter and Transfiguration cartridges. Except at extreme volume levels, I found the PH7 as quiet as the solid-state Xono. For a sonic comparison, I considered Traffics rendition of the English folksong "John Barleycorn" from John Barleycorn Must Die [Island 900580-1]. Through the PH7, images were more dimensional and voices more realistic. As compared to the Xono, Steve Winwood no longer sounded like his voice was strained in the dynamic passages, as the ARC phono stage lifted a bit of gauzy grain that overlaid his singing. Both units laid out a spacious soundstage. I heard the opening triangle appear three to four feet outside the left speaker. The Xono placed its strike slightly forward, and its tone was thinner with more of a glass-like resonance. The PH7 rendered the triangle behind the speaker with a deeper metal-on-metal ring and decay. When the tambourine and triangle play together, the PH7s superior harmonic resolution separated each and revealed further nuance to Capaldis playing. By direct comparison, Chris Woods flute on the right channel was slightly smeared with the Xono, and likewise more forward. Both phono stages did well in distinguishing the duet portions, and words were clear, though the backup vocals were less recessed and had more body through the PH7. I listened to both phono stages render Gerald Finzis Intimations of Immortality with Robert Handley conducting the Guildford Philharmonic Choir and Orchestra [Lyrita SRCS 75]. Intimations is a big work with full orchestra, choir and solo tenor, and it has cool lyrics based on a Wordsworth poem of the same name. The delightful Lyrita recording is one I use often when reviewing. It has big, solid dynamic passages that rise and swell, and to get these right a system needs to resolve when the orchestra, choir, and soloist are all going at it together. The Xono rendered this work with an open, spacious perspective with nice atmosphere -- I sensed the microphones were seeing a lot of people in the hall. The Audio Research phono stage not only revealed the overall ambience, it yielded better air around individual instruments and singers in the choir. The entire chorus was more distinct -- I sensed not just bodies, but heads, mouths, and individual voices -- and even the male voices in the back right portion of the stage were clearer and more individuated. Tenor Ian Partridge was better separated from the orchestra; he came a couple feet forward and his song had more weight. With the PH7, individual instrument outlines were better positioned in their sections, while the Xono unfolded a slightly wider soundstage. There was a point where I concluded the Xono had slightly better rhythmic control than the PH7 and was more vivacious driving the music forward. Somehow, this didnt seem quite right with what else I was hearing in the midbass, a key area for proper timing. It took me a while to figure it out, but what I thought was a reticence in pacing was put right by a slight two-thread adjustment of the SMEs damping paddle. Here again the PH7s elucidation helped me dial in my cartridge and tonearm. True to its solid-state heritage, the Xono produced a wee bit sharper leading edge on low-bass transients, though the PH7 demonstrated better decay and harmonic clarity. Through it I could follow bass lines more easily. Both devices did a good job delivering low-bass weight and impact, though the PH7 was more harmonically tuneful in this part of the frequency spectrum. As the choir sings "And the children are culling on every side, In a thousand valleys far and wide, Fresh flowers while the sun shines warm," the Xono will tell you there is a bass foundation under these words. I caught leading-edge enunciation, so I knew the basses were moving. The PH7 simply offered more, as I heard quick double-bass arpeggios wholly intact. Lyrita engineers captured percussion instruments like no one else, and the PH7 was true to their efforts. Cymbal crashes were not shy with their brassy harmonic of metal-on-metal impact. As the cymbals drew apart, the sound bloomed outward, the energy of their crash expanding into space as a dimensional ball of sound. The Xono has a lot going for it. It is quiet and flexible, has plenty of gain, and offers a spacious soundstage. Music through it has punch and drive. However, I found the PH7 more sophisticated in every respect. Music through it simply sounded more like the real thing. The PH7 portrays the full measure of what your turntable, tonearm and cartridge have to offer and faithfully delivers that content to downstream components. It is capable of superb dynamics, sumptuous and neutral tonality, speed, nuance, and detail. Its virtues are balanced across the broad sweeps of frequency and genre. Herein lies perhaps the PH7's strongest suit: From lows to highs, its sound is coherent and consistent, cut from whole cloth. Clear aural images reside within a dimensional soundstage, while no obvious weaknesses stand out. Regardless of where you position the phono stage in your pantheon of audio components, Audio Research deserves top marks for the PH7. With it you may learn, as did I, that there is more truth and beauty in the grooves of your record collection than your system previously revealed.